Internet commerce is an amazing phenomenon. Out here in Sherman County, Kansas, we love it! Since we are three hours from the nearest mall, the internet has become our virtual mall. We can visit Target, Home Depot and Bath and Body Works all in a matter of minutes. And.... we don't even have to use any gasoline to get there! Any way, back to the original subject - Internet commerce is an amazing phenomenon. Take my Etsy shop, for instance. Not only do I have the entire world at my virtual doorstep, I have been able to connect with so many wonderful people. 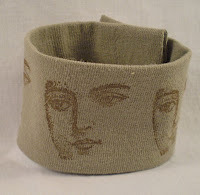 Recently I sold a Mysterious Woman Wrist Cuff Wallet to zJayne, a fellow Etsy shopkeeper. 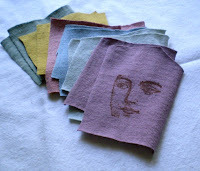 From that humble connection, my Mysterious Woman printed on scraps of t-shirt cotton have been beautifully worked into zJayne's True Colors Pouch Wristlet. zJayne's Etsy shop is a wonderful constellation of altered art that is both beautiful and functional. I'm quite honored to see Mysterious Woman included in such a great line of functional art. No matter where you live in the virtual universe of internet commerce, you absolutely MUST travel to Ohio to visit zJayne's wonderful shop! Here is the original Mysterious Woman. Here are the women that traveled to Ohio. Hi Mary Zoom! Your wrist cuff wallets are great! Very good idea, and cool designs. Have a nice week! From Unni.